Jeff Kunion (right) has been the PGCBL President for almost six years. 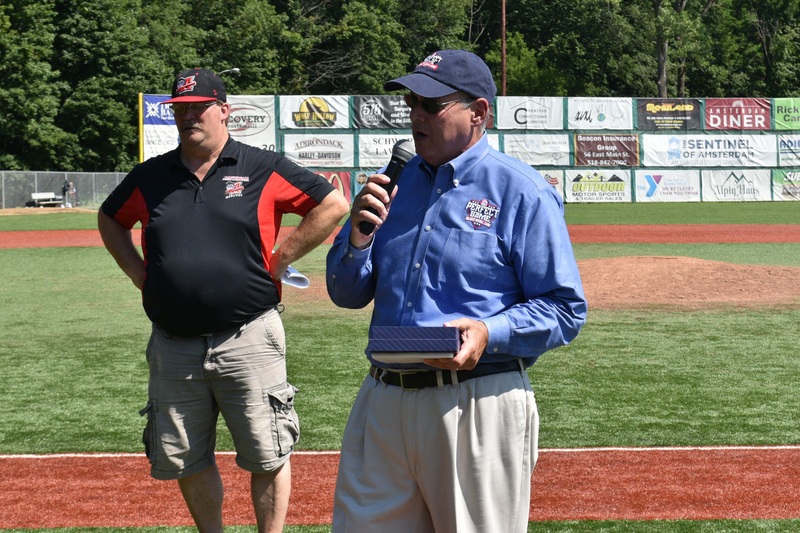 Perfect Game Collegiate Baseball League (PGCBL) President Jeff Kunion announced today his intention to retire from his role as president when his contract expires at the end of the 2017 calendar year. "My family will shortly be moving to Florida and with all of our teams in upstate New York, I would no longer be able to continue my work," Kunion said. He added, "We have come a long way in the almost six years I have served as league president. We have added six new teams, increased our level of competition, had hundreds of players drafted by MLB and play professional baseball, increased our fan base and attendance, and created a footprint across upstate New York. We have become one of the premier leagues in the country and the No. 1 league in New York State." Kunion has amassed more than 30 years of experience in the baseball world during his professional career. He began with the New York Mets in 1980 and spent seven years in their business office. He subsequently owned, operated and managed teams in the Double-A Eastern League, Northeast League and Central League. He also spent more than 10 years as bench coach and/or Director of Player Personnel for the North Shore Spirit (Can-Am), Florence Freedom (Frontier), Jackson Generals (Central) and Elmira Pioneers (Can-Am). Prior to being named president of the PGCBL, Kunion owned the Elmira Pioneers (NYCBL/PGCBL). In a statement, the PGCBL Board of Directors applauded the work of Kunion. "We want to thank Jeff for his time with the league. His leadership and service has been instrumental in getting the league up and running. With his help we are one of the best run leagues in the country." The Perfect Game Collegiate Baseball League is a 13-team summer collegiate baseball league in Upstate New York. Since its inaugural season in 2011, the PGCBL – which annually draws talent from some of the best NCAA, NAIA, and junior college programs – has quickly evolved into the premier wood bat league in the state of New York, while becoming one of the most widely respected summer leagues in the country. The PGCBL is affiliated with Perfect Game, the nation’s largest independent amateur scouting bureau. Last year, there were more than 1,500 players in the pros who either wore the uniform of a PGCBL team or participated in a Perfect Game event. For more information, please visit www.pgcbl.com.